It never fails. You’re at an important business dinner with your boss; you’re meeting a blind date for a first-time brunch; you’re at your significant other’s parents’ house for Sunday family dinner and a piece of spinach quiche gets wedged between your two front teeth. Embarrassing dental moments like those can be awkward, especially if they happen around people you’re trying to impress. 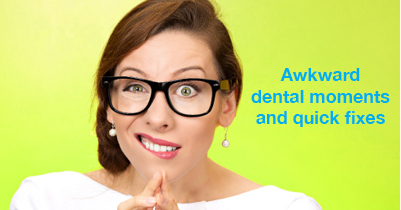 At our dental office in Austin, we have a few tips and tricks to easily resolve any dental faux pas with ease. If you do get a piece of food stuck in your teeth, there are several ways that you can remove it. Some of the techniques can be done at the table and are subtle enough to not draw unwanted attention. For example, swishing some water around in your mouth can be successful in loosening your lingering piece of lunch. If water doesn’t work, a piece of sugarless gum can help unstick the wedged food particle. However, there are times when the food is really stuck in there and water swishing and gum chewing won’t budge it. When this happens, you’ll have to take the next steps and excuse yourself from the table and visit the restroom. If you have some floss, which we always recommend carrying, it’s the best at removing anything that’s stuck between your teeth. If no floss is available, a corner of a folded paper towel could work, too. It’s important never to use something that could cause damage like hairpins, tweezers, keys, or pens. Other times, it’s not a lingering piece of food that causes awkward moments, but the lingering stench of your garlic pasta entree. If post-dinner bad breath is common for you, make it a point to buy some sugarless gum before you arrive at the meal and chew it when you’re finished eating. However, if you don’t have any gum, there are other tricks you can use to squash bad breath. Water can help wash bad breath culprits from the tongue, and if you need to take it a step further, a spoon or tongue scraper can be used (It’s best to not use either at the table – head to the restroom instead). If your bad breath is more of an everyday occurrence and not just a sporadic, post-meal problem, it may be a sign of something more serious and we recommend a visit your dentist in Austin. Nobody enjoys awkward moments at events that are already stressful, but with a little planning ahead (buy that gum, pack that floss), and with the knowledge of helpful tips and tricks for fixing embarrassing moments with poise, you’re ready to handle any embarrassing smile moment. Serving patients in Austin, Westlake, Cedar Park, and surrounding communities. There’s a lot to celebrate during this time of the year – health, family, love, and friendship. Typically we show each other our appreciation by sharing gifts, celebrating, and eating with our families. However, if you’re hiding your smile during these joyous occasions instead of grinning wide, it may be time to think about celebrating a new smile. At our dental office in Austin, we have a multitude of cosmetic dentistry options that can transform your smile and give you the confidence you deserve. Dental bonding can be used in a variety of ways, but is most often used to successfully repair chipped or ground down teeth. Bonding is an artful treatment that perfectly matches the restoration to healthy surrounding teeth. When done well, the bonding will make a seamless connection, making it difficult, or even impossible, to see the former damage. One of the most common cosmetic dentistry treatments is also one of the easiest way to get your smile dazzlingly white. A professional whitening by your dentist in Austin is a quick, painless, and extremely safe option to get your smile its ideal shade of winter white. 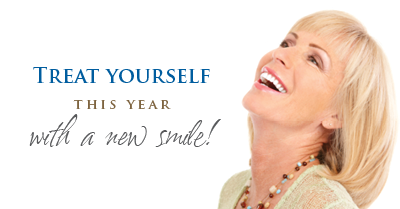 It may be all your smile needs to give it the boost it needs to make you confident again. If professional whitening doesn’t work for you, there are other options. Sometimes, superficial stains on teeth do not disappear through a smile whitening alone. When this happens, we typically recommend porcelain veneers. Veneers are thin pieces of porcelain that are custom-shaped and placed over the natural tooth for a whiter, brighter look. They can also be used to repair fractured teeth, close a gap between teeth, or to restore a smile that has unproportional teeth. Stop hiding your teeth in pictures, at holiday parties, and during all the festive, cheerful moments in your life. At our Austin dental office, we can give you the smile of your dreams using any of these treatments or a combination of these and others. No matter what your ideal smile is, we can discuss the best way to make that dream smile come to life. Serving patients in Austin, Westlake, Cedar Park, and surrounding areas.